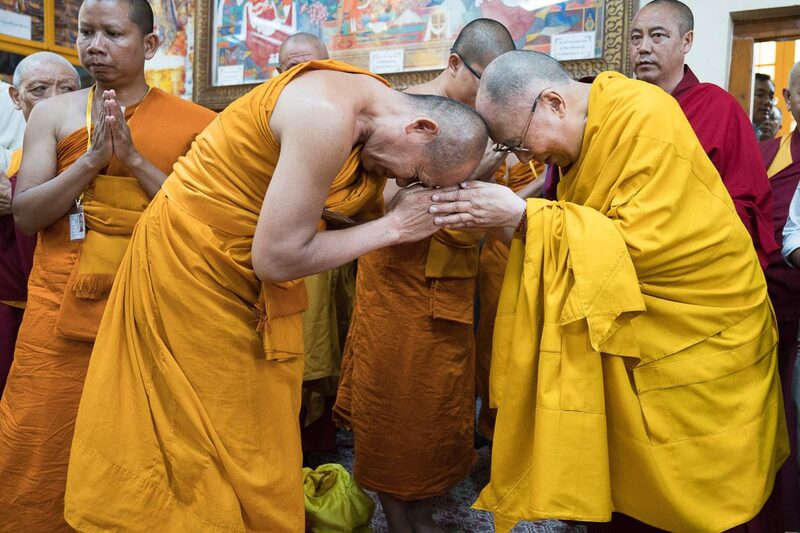 (TibetanReview.net, Jun09, 2017) – A group of 60 Buddhist monks from Thailand on Jun 8 received blessings from the Dalai Lama before they set out on a march for world peace from Dharamshala to Leh, capital of the Ladakh region of Jammu and Kashmir. It was the final of the Dalai Lama’s three-day introductory Buddhism teaching for the Tibetan youth which the Thai Buddhists attended. The march has been organized by the Dharamshala-based Thai-Dharamshala Charity Society. The group has said, “The march is aimed at promoting love, compassion and world peace as a whole”. This is the second year the group is leading a peace march. “We headed out on a march on 2016, to Leh on the same occasion of Buddha Purnima after receiving His Holiness the Dalai Lama’s blessings,” march leader Hatyai Pharyatha Suthi was quoted as saying. “We are participating in the march to promote and share peace among humanity. World peace through peace of mind and meditation,” another monk in the peace march was quoted as saying. This was the 11th year the Dalai Lama gave the introductory Buddhism teaching for the Tibetan youth. It was organized by a group called Buddhism Introductory Committee of Dharamshala since 2007. After leading the congregation in a simple ceremony for generating the awakening mind, the Dalai Lama appealed to everyone present to share the idea of the oneness of all humanity with ten friends. He explained that if each of these friends then follows it up with ten other of their friends and the process is repeated continuously down the line, the result would be to spread the message far and wide.